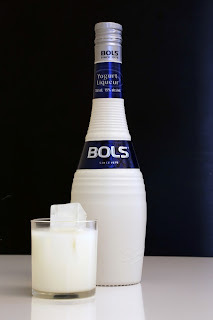 Bols Yogurt Liqueur was released a couple months ago and everybody from Bon Appetit to Maxim likes it. No wonder. This is something different from anything you've had before, and how often can you say that? And it's delicious. You might be thinking, yogurt liqueur? Yogurt??!! You might think with excess punctuation; sometimes I do. Imagine a drinkable yogurt, on the sweet side, but with that distinctive tartness that keeps it balanced. Its only 15% alcohol, and you can't really taste the alcohol on the front of the tongue, although it does leave an impression on the back. I can imagine drinking this for breakfast, and that would probably put me in a much better mood. Perhaps it will be used to make boozy smoothies. It might be interesting to mix with a fruit liqueur like Chambord. Or check out the cream soda recipes below (though I would use soda water instead of 7Up). But I find it delicious by itself on the rocks, as a dessert drink, especially after spicy food. I don't know if it's settling my stomach like yogurt, but it does relax the mind. The liqueur was originally launched in China because of a demand for a milk-based spirit, which surprises me because so many Chinese are lactose-intolerant. It may have been created with marketing in mind, but kudos to the Bols engineers because they took a wacky-sounding idea and made a perfectly self-contained product. People have been trying to make chocolate liqueurs for decades, but I've never had a good one. Maybe that's because chocolate liqueur makers overcommit to sweetness, while the yogurt liqueur must have balance. Bols Yogurt Liqueur is only $18 a bottle and widely available. If you like yogurt -- who doesn't? -- give it a try.